Our Blush Quilted Vest with Pockets is perfect to pair with any top! You'll want to add this to your cool-weather wardrobe! Definitely a MUST HAVE piece from our online boutique for the upcoming Fall and Winter season! I'm in love. Warm, comfortable, and cute as a button! The color is great and it has awesome pockets. Always get compliments on it but it does run a tad small. 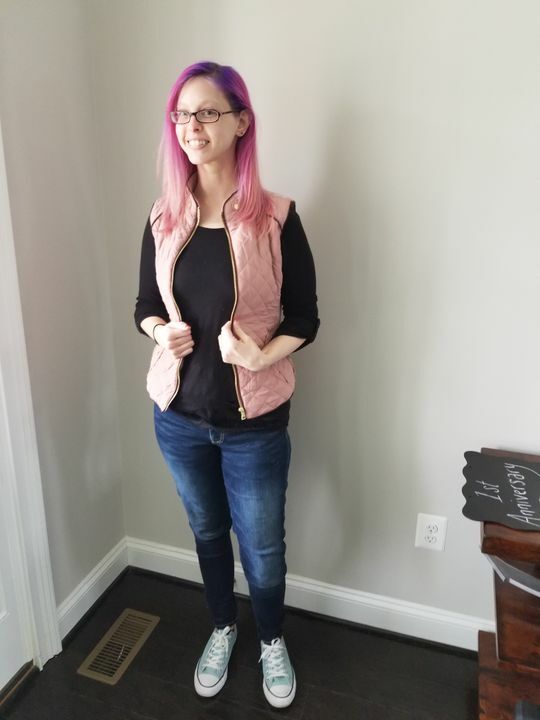 Loved my blush colored vest! Great quality. Came in the mail quickly. Loved the way it was packaged, and really appreciated the personal touches to the packaging. My words when I opened it up were, “I’ll be ordering from here again!” I’m impressed with the quality of the vest and it’s one of my favorite pieces right now and it fits perfectly! So glad I bought it! AARON J. Reviewed by AARON J. Wish I had ordered the small. I’m 5’5, 135lbs, 34B and it fit a little bigger than I liked. Olga A. Reviewed by Olga A.